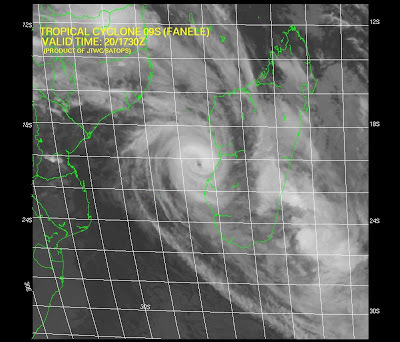 Tropical Cyclone Fanele experienced rapid intensification in the Mozambique Channel over the past 24 hours, looping and striking the Madagascar Coast a little after 1Z on the 21st. While the area impacted isn't densely populated, two cities did bear the brunt of this storm's left front quadrant. The communities of Belo-Sur-Mer and the more densely populated Morandava to the north endured 100kt (115mph) winds as it came on shore. Unfortunately, it should be noted that most of the housing exits at an elevation below 20ft above-sea-level. 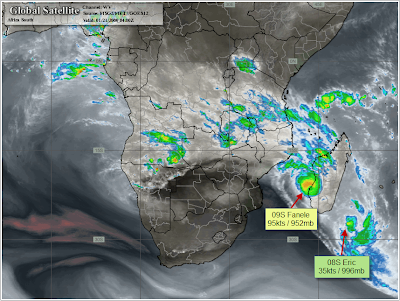 08S Eric - Now no longer sideswiping the east coast of Madagascar, Eric is heading off to the south and losing steam. 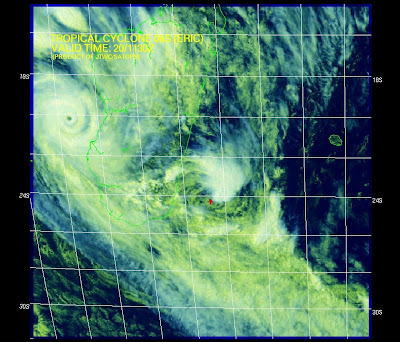 The JTWC is issued its final advisory on the storm. 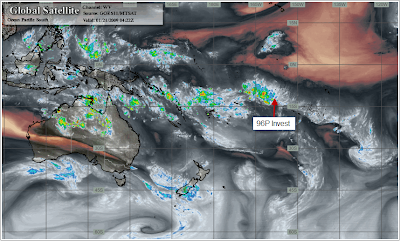 Only two other areas being watched at the moment, one in the southern Indian Ocean and the other in the Southwest Pacific. 97S is remarkably close to the equator. 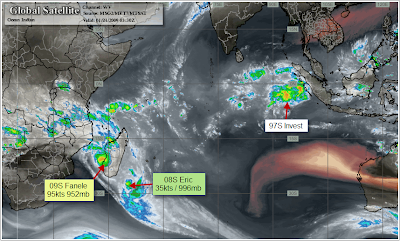 (Due to Coriolis, it is hard to find tropical cyclone development in close proximity to the equator). Finally, what a day we had here in Denver! While official reporting stations only topped out in the upper 60's, several UDFDC mesonet stations eclipsed the 70ºF mark ... in January! We should expect to see this again tomorrow ... and maybe Thursday as well. Sounds like a good day to be outside. 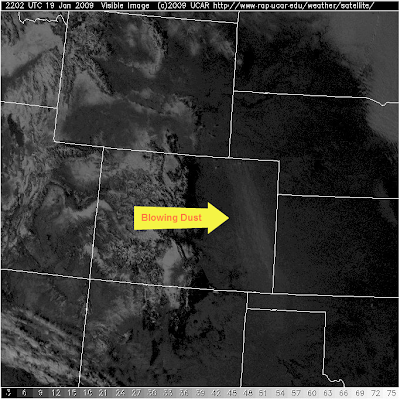 Yesterday (January 19th), intense north-northeasterly winds scoured dust off the plains as seen in the satellite photo below. 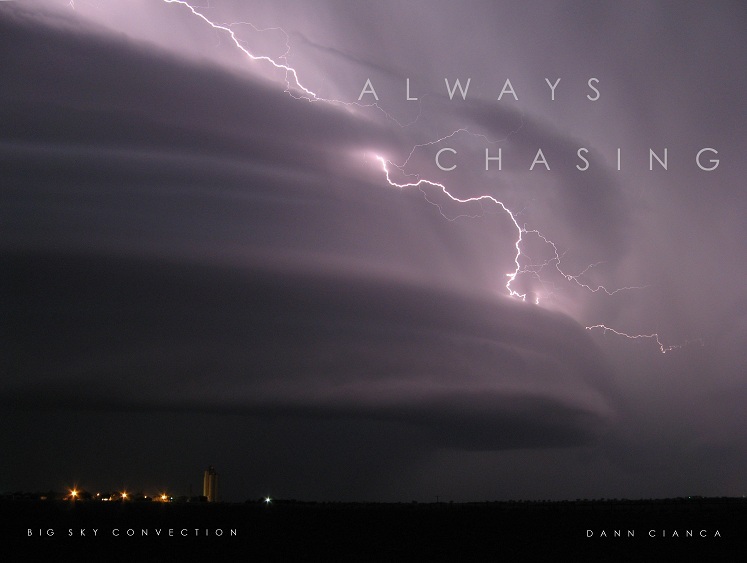 This dust storm caused a multi-vehicle pileup that claimed the lives of two.